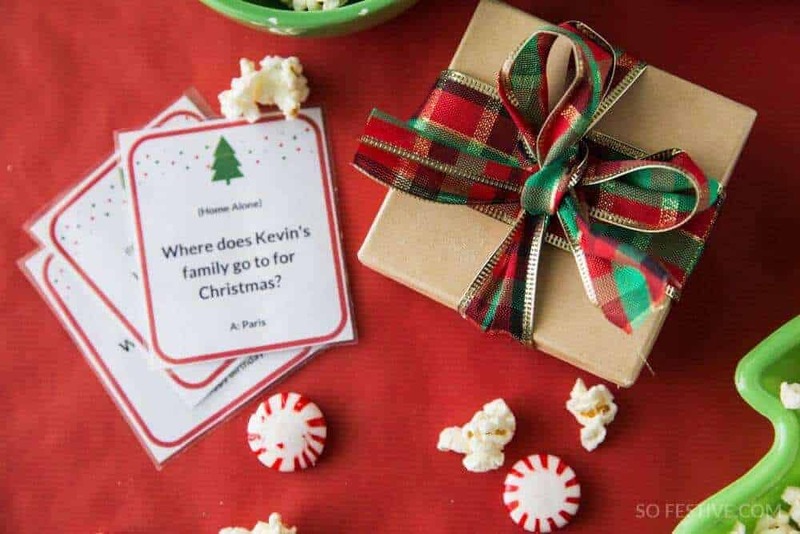 Christmas Movie Trivia Game- Christmas Party Game Idea! - So Festive! Calling all Christmas Movie fans! 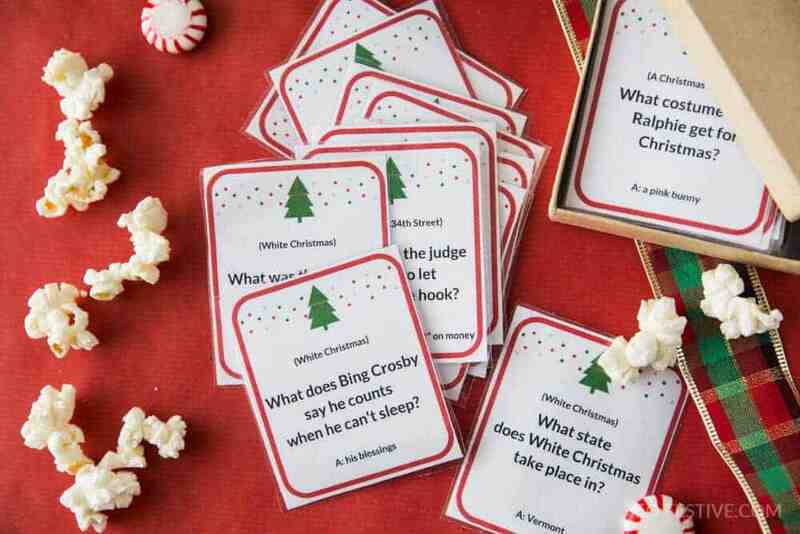 This Christmas Movie Trivia game is just for you! 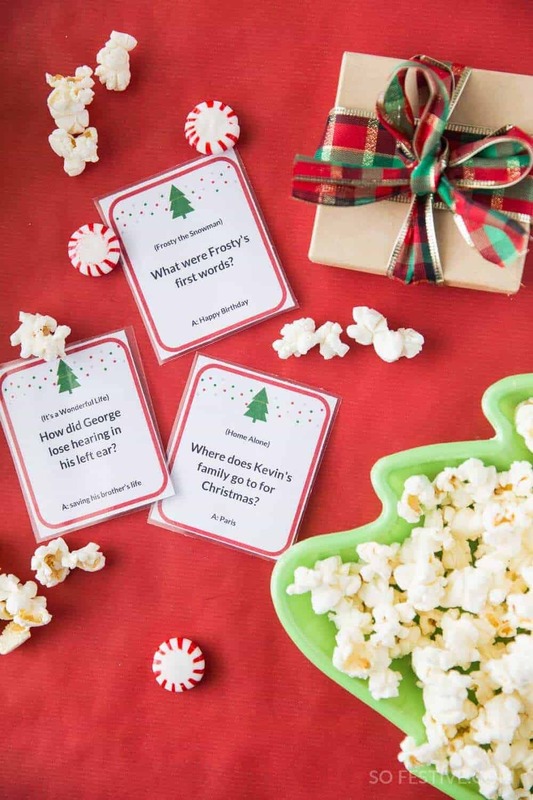 Perfect for family parties, gifts, friend get-togethers, road trips, and dinner conversations, see how well you do answering these trivia questions from classic Christmas movies! We love playing a group game on Christmas Eve or at a family Christmas party during the holiday break. Christmas Minute-to-Win-it was a huge hit and so was the Christmas White Elephant Gift Auction. 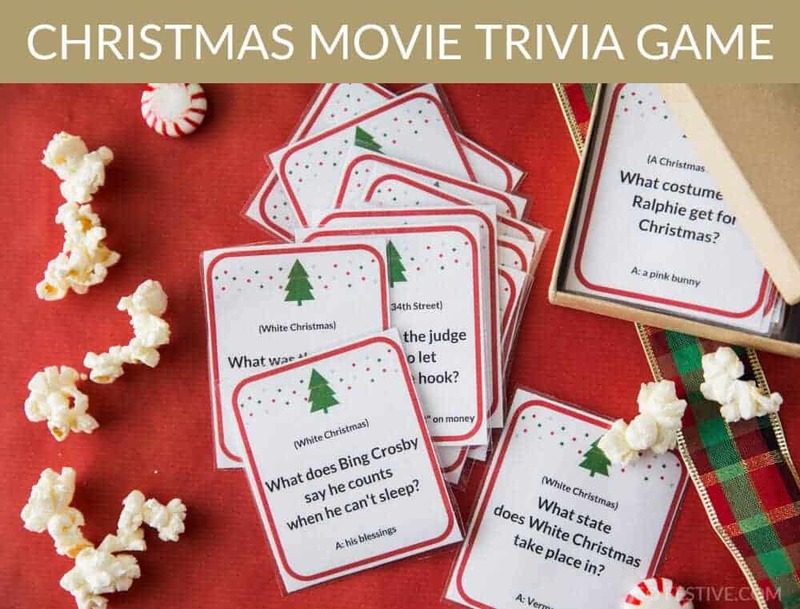 I’ve always thought a Christmas Movie Trivia Game would be a fun game to add to the mix, so I searched long and hard for one online. Yet, I couldn’t find anything I was looking for. So I did the next best thing– create my own! If you’re looking for a fun and simple Christmas game for a party or get-together, or to keep busy while you’re in the car traveling, you’ll love this! For a traditional party game, split into teams. Have a person from team A pull out a card and ask a team B member the question. If that person answers correctly, their team gets a point. The first team to certain points or after a certain time limit wins. For another version, have the host of the party ask the questions. All the party guests write their answers on a piece of paper. Whoever gets the most correct wins a prize. For a road trip, take turns asking the trivia questions. For a date night- the spouse that gets the most answers correct wins! Don’t keep all the fun for yourself! 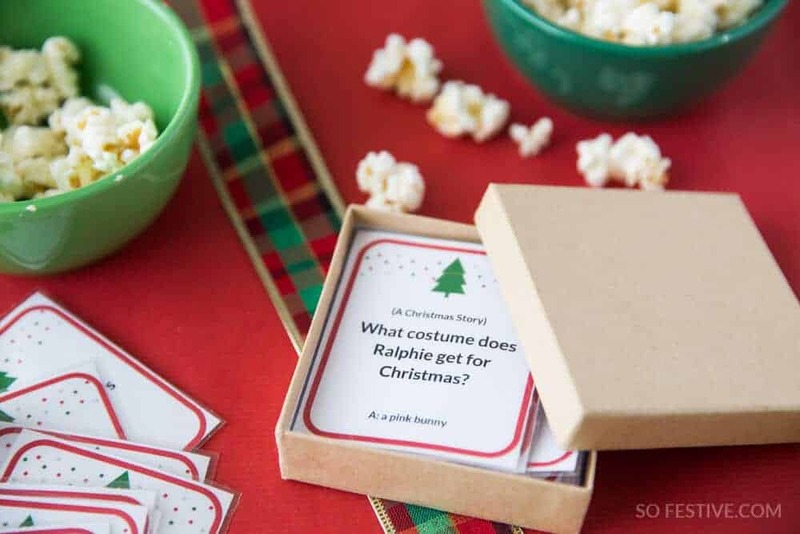 This Christmas movie trivia game would be a fun gift to give to neighbors, friend, or as a family gift. The cards fit in a small gift box you can find at a craft store. 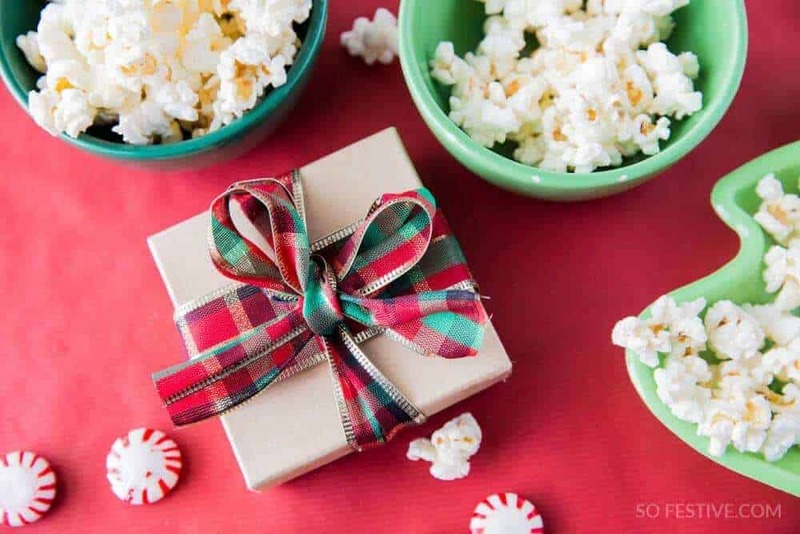 Tie the box with some festive ribbon, attach a bag of popcorn, and viola! You’ve created a fun and creative Christmas gift. Tip: Laminate the game cards to keep the cards in good shape year after year! So what movies do these trivia questions come from? If you haven’t seen any of these movies, don’t worry! Each trivia question is on an individual game card, so you can remove any movie questions you don’t want to play with. Ready to play this trivia game?